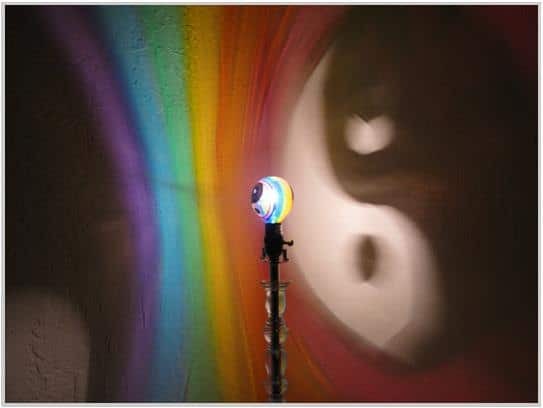 This modern Bulb casts the Yin and Yang symbol onto your walls and ceiling, floor lamp or onto any white lampshade with each color of the Rainbow in between! Rainbow Light is known to be very healing and balancing! And the Ying Yang symbolizes balance and unity! It has been known for eons of time that color plays a major role in setting up a particular mood or state of mind. Color does affect one’s feelings, moods, and emotions. Colors are certain wavelengths of electromagnetic energy seen through our eyes. The color we see is the part of the visible spectrum that is reflected back by a certain object. MoodLight Bulbs Floor Lamps are hand painted with high temp acrylics and project the painted image and colors onto the walls and ceiling or onto any white lampshade! The paint is permanent and safe for kids, pets, and the rest of the planet!